Also referred to as the Shetland Islands, they are located about 215 miles north of Aberdeen, Scotland. There are over 100 islands in the group, 15 of which are inhabited. The largest island is simply called “Mainland“. Another island, Fair Isle, lies about halfway between mainland Shetland and Orkney. It is known for its bird observatory and a traditional style of knitting. Lerwick, located on Mainland, is the capital and largest town in Shetland, with a population of around 7,000. It is a popular cruise port, almost 90 vessels are already booked for 2018, bringing around 93,000 passengers. If you are on a cruise that makes a port stop here, they keep the church open from 0830 to 1830 daily…so even if you cannot attend Mass, be sure to stop in. The northernmost Catholic parish in the British Isles, the parish covers the entire Shetland Islands and also serves the pastoral needs of the oil and gas industry, as well as ships putting in to Lerwick Harbour. The Parish is part of the Diocese of Aberdeen, and is more commonly just called Saint Margaret’s. The Czestochowa Chapel, which is located within the Parish Room adjacent to the Church, is available for private prayer. The parish room is normally open from 8.30 am until dusk in winter, and until 6.30 pm in summer. There are books, newspapers and facilities for making tea and coffee. There are daily and weekend Masses, as you can see from their website. We wish to thank Fr Ambrose Flavell, OSB. for the information and photos. Fr. Ambrose is Parish Administrator for the Parish of St. Margaret. A note about the Catholic faith in Scotland: It is interesting that, according to this study, although many who used to identify as Christian (primarily Protestants), no longer practice the faith, the number of Catholics in Scotland has remained fairly steady and is actually increasing among younger Scots. Shetland is also served by a ferry connection from Lerwick to Aberdeen on mainland Scotland. The trip takes about 12 hours, leaving Aberdeen around 7:00 p.m. and arriving next morning around 7:00 a.m. 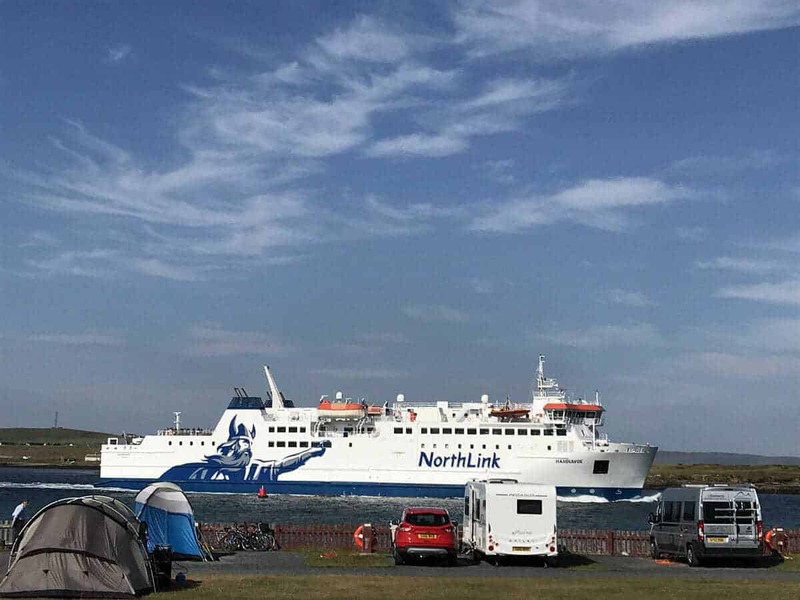 The ferry is operated by NorthLink Ferries. You can find their schedules here. Click here for the official website for the parish.